Almost exactly two years ago, at the peak of the Vancouver housing bubble which was the result of an unprecedented money-laundering funds flow by Chinese oligarchs and tycoons into the Western Canadian real estate market, we brought you “The Rich Chinese Kids Of Vancouver“, which as the title suggests, profiled the spoiled offspring of some of China’s richest. You will know them by their Lamborghinis: hundreds of young Chinese immigrants, along with a handful of Canadian-born Chinese, have started supercar clubs whose members come together to drive, modify and photograph their flashy vehicles, providing alluring eye candy for their followers on social media. Since those crazy days of 2016, the Chinese invasion of Vancouver has eased (certainly crushing the local real estate market as noted in ““Ghastly” Vancouver Home Sales Crash By 46%, Lowest Since 1985“), and following the imposition of some substantial, if hardly draconian, anti-money laundering measures by Canada as well as real estate purchasing curbs, the rich Chinese kids of Vancouver phenomenon – which just accidentally coincided with the second great cryptocurrency bubble – gradually faded into the background. But it certainly did not die and every now and then we get a stark reminder of just how much funds China’s “0.1%” transfers overseas (in fears that China’s own economic collapse is only a matter of time). A reminder such as this one from the South China Morning Post, which writes that the son of a Chinese tycoon is buying a C$5.1 million (US$3.8 million) custom Bugatti sports car in Vancouver, using his daddy’s Union Pay credit card, according to a picture of the invoice the young man posted on Instagram to complain about Canadian taxes. In a move that could make even the Kardashians blush, Ding Chen published a copy of the bill bearing his father Chen Mailin’s name on his Instagram stories, with an exasperated message overlaid in Chinese: “These taxes … my heart feels tired”. 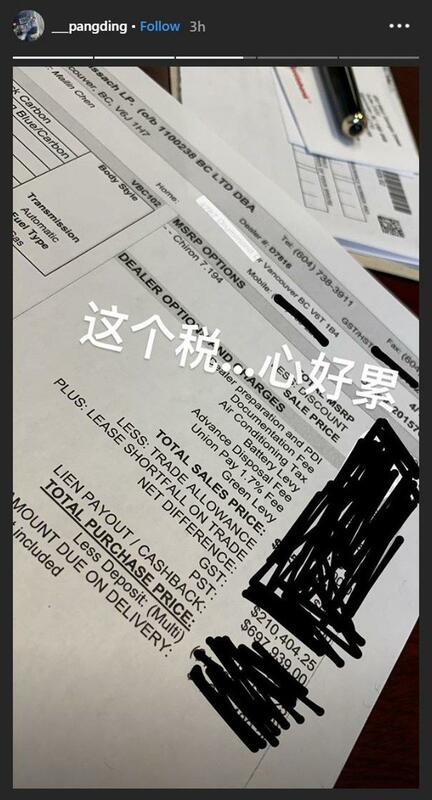 An image on Ding Chen’s Instagram stories on Thursday showed an invoice for a Bugatti Chiron, in his father Chen Mailin’s name, with taxes of more than C$900,000. The overlaid message reads: “These taxes … my heart feels tired”. The photo, which was posted around noon on Thursday and set to vanish 24 hours later, had been roughly edited to scrawl out most figures, except the taxes. But, as the SCMP calculates, the 5% federal goods and services tax of C$210,404.25 reveals a pre-tax price of C$4.2 million (US$3.1 million), the approximate list price of a Chiron. Additional provincial taxes of C$697,939 (US$522,100) bring the total purchase price to about C$5.1 million. The cherry on top: the bill includes a 1.7 per cent Union Pay fee, which, if imposed on the pre-tax price, would work out to C$71,400 alone – about the price of a BMW M3. Perhaps fearing retaliation from China’s ongoing anti-corruption campaign, just one hour after the SCMP article was published, Chen’s Instagram account was closed or locked down. To be sure, the image will spark some serious inquiries from the Chinese Communist Party which will want to inquire just how the junior tycoon managed to pay using his daddy’s “gas card”: the problem is that after an aggressive crackdown against money-laundering by Beijing in 2016 and 2017, China’s Union Pay credit cards have been the subject of increasing scrutiny as a conduit for money out of the mainland. China has an annual cash export limit of US$50,000, and Union Pay says it enforces an annual overseas cash withdrawal limit of 100,000 yuan (US$14,880). Yet while overseas purchases of more than 1,000 yuan (US$149) must be reported to Chinese regulators, there is no general limit on spending, and there is no suggestion that the purchase of the car is improper. The bill, from Vancouver Bugatti dealer Weissach Group according to a visible phone number, was issued to Chen Mailin, whose name was clearly displayed. The address of his home on Vancouver’s Drummond Drive was whited-out but still readable. 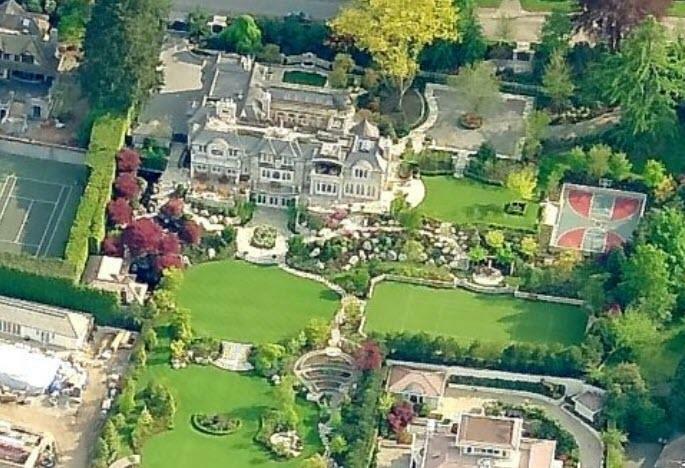 The address is that of a palatial home purchased by Chen Mailin in 2015 for C$51.8 million (then US$40 million), in what was then believed to have been the biggest residential transaction ever conducted in Canada. But who is Chen Mailin (i.e. “daddy”)? As often happens in China, his rags to riches story is yet another shocker: the 49-year-old Jiangsu province businessman is a former duck farmer who founded what is now a skyscraper-building property and investment conglomerate, Nanjing Dingye Investment Group, of which he is chairman. He is a former member of the Chinese People’s Political Consultative Conference, China’s legislative advisory body. And, citing a corporate disclosure, the SCMP notes that Chen Mailin is also a permanent Canadian resident (just in case Beijing decided to issue a fatwa on the nouveau-riche billionaire). Ding Chen – who bears a striking resemblance to Chen Mailin – is the businessman’s son, according to the tycoon’s assistant at Chunghwa Investment company in Vancouver. The assistant told the South China Morning Post on Thursday to call Ding Chen on Friday at a nominated time, but the call went through to voicemail and has not yet been returned. Patrick Kam, a salesman for Weissach Group, Bugatti’s official dealer in Vancouver, said only one Bugatti Chiron had been sold and delivered in Vancouver. “It’s a very esoteric car,” he said. Curiously, Kam said that particular car had not been bought with a Union Pay card. But he said he was “not at liberty to discuss sales that may or may not be in the works”. Still, a Union Pay credit card would indeed be accepted at Weissach if someone wanted to use it to buy a C$4 million car, or any luxury vehicle. “Yeah, it’s a regular mode of payment that we take,” said Kam. 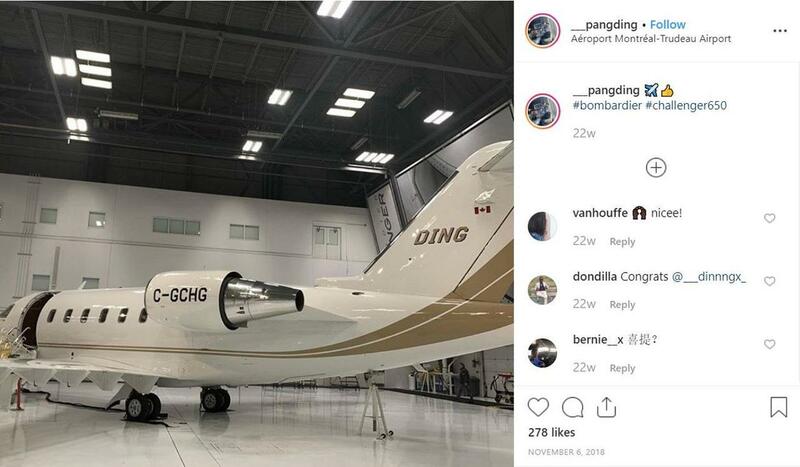 Just as profiled in our post from April 2016, Ding Chen’s Instagram feed is filled with scenes of conspicuous consumption across the world, including a $30 million Bombardier Challenger jet with his name, “Ding”, emblazoned on the tail in Montreal; straphanging on the Hong Kong MTR with an Audemars Piguet watch on his wrist; and posing in Gucci leisure wear in Las Vegas, Nevada, and Shanghai. 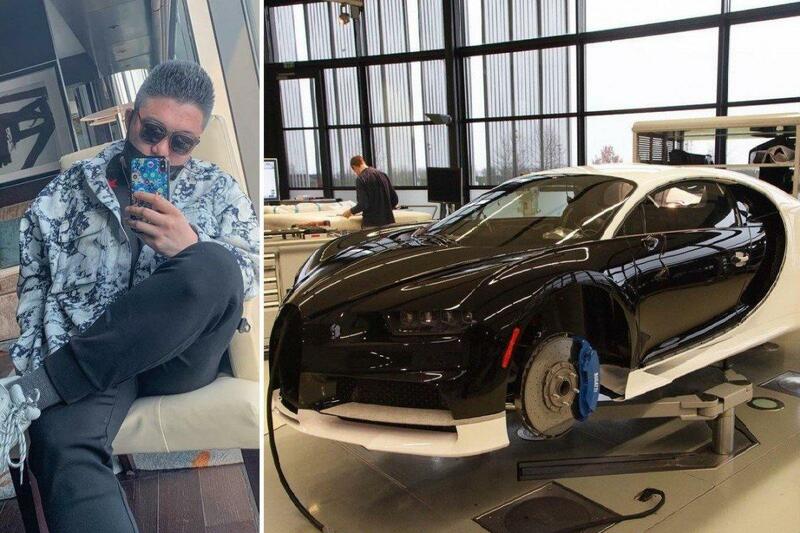 Other photos apparently show his new Bugatti Chiron in various stages of completion as it undergoes extensive customisation. “It’s on its way. 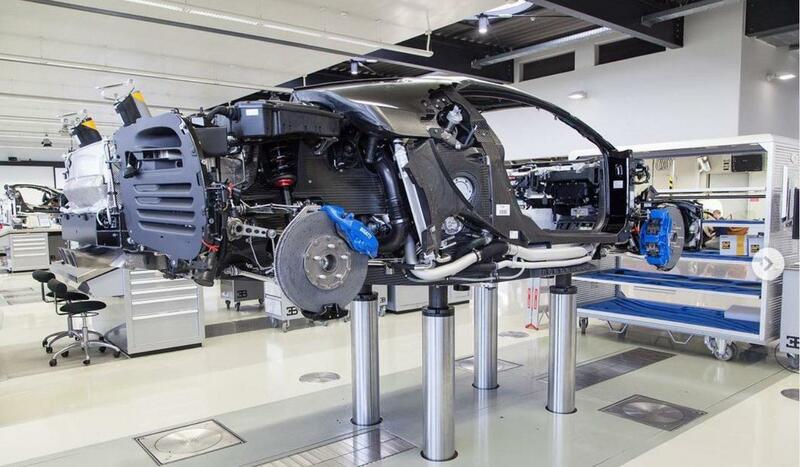 #bugatti #chiron #w16,” he posted on February 26, with a photo of a mostly dismantled Chiron in a laboratory-like workshop. “The next stage!” he posted on March 12, with a photo of a Chiron, still wheelless but with body work attached. 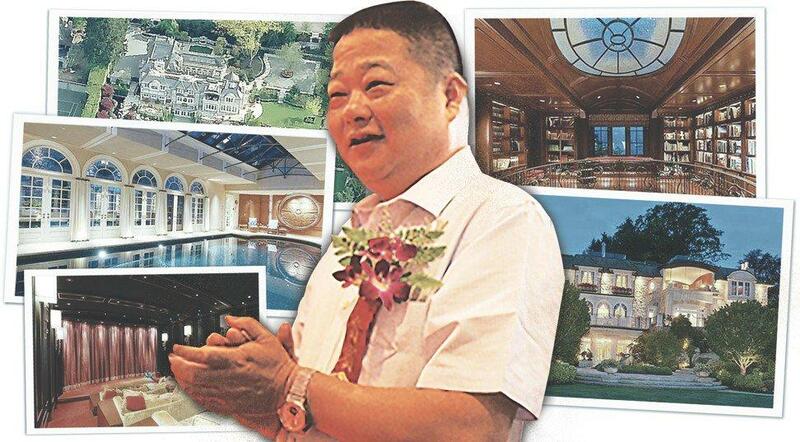 Ding Chen’s big-spending father, meanwhile, has been the subject of media scrutiny in Vancouver ever since buying the Drummond Drive home. As we noted at the time, Chen Mailin was mentioned in a 2012 Canadian court ruling in which prominent Vancouver realtor Julia Lau claimed he was a friend who loaned her C$30,000 out of C$131,000 in undeclared cash. The money had been seized by Canadian border authorities in 2010 from a car broker named Jason Edward Lee as he tried to board a flight to Las Vegas. Lau said the money was intended to replace funds she had already given Lee, via wire transfer, to buy her a Porsche in the US. Lee claimed the wired funds never arrived in his account. The judge in the case found that Lee had instead “squandered” the wired funds at a casino. Lee, who told Canadian authorities the C$30,000 came from a “loan shark”, according to the ruling, was found dead of a heroin overdose in the boot of his car, with zip ties around his wrists and ankles, about a month after Canadian authorities seized the cash. There was no suggestion in the court case that Chen Mailin is a “loan shark”. Meanwhile, business as usual continues as China’s wealthiest can’t wait to transfer their savings offshore, even as Beijing, now facing its first current account deficit in modern history, is desperate to open up its own corrupt and crony capital markets to yield-starved foreign investors who in turn will make sure that Ding Chen ends up buying many more Bugattis before he too is mysteriously found deceased of a “heroin overdose” in the boot of some (super)car himself.